This March, students from Tokyo’s Keio University Choir and UBC’s Baroque Orchestra Mentorship Program (BOMP) teamed up with Early Music Vancouver for a gorgeous performance of Buxtehude’s Membra Jesu Nostriat Christ Church Cathedral in downtown Vancouver. The groups performed the German composer’s 17th-century masterpiece to a large and enthusiastic audience. Among those in attendance was Keio University alumna and longtime UBC School of Music supporter Tamako Copithorne. For Tamako, who helped to support this initiative, it was more than just a concert. It was the latest highlight in a passion project that goes back over sixty years. “In 1955, I came to Canada for the first time as an exchange student from Japan to the University of British Columbia,” Tamako says. At the time, such programs were virtually unheard of. Tamako was among the first Japanese exchange students to study in Canada, and her experience at UBC (and later the University of Toronto) was so compelling that she returned home determined to help pave the way for future students — Japanese and Canadian — and continue to build the relationship between Keio University and UBC. In fact, the program built on a much longer history of Japan-Canada cultural exchange that went as far back as the 1870s, when Yukichi Fukuzawa, the founder of Keio University, hosted the Canadian missionary Alexander Croft Shaw. The two men became good friends and colleagues and influenced one another’s thinking on education and the role of cultural exchange. Tamako was both thrilled and humbled to be part of such longstanding intercultural dialogue. 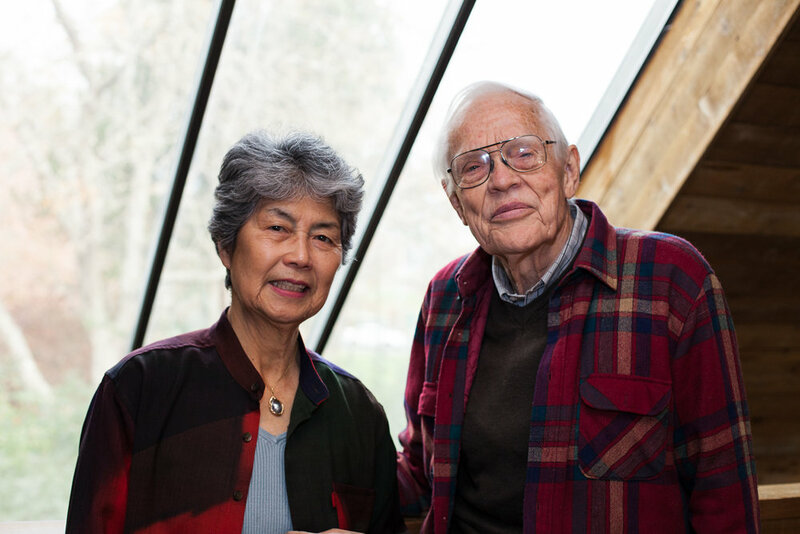 Her experiences as a student were formative in another way: It was while at the first World University Service International Student Seminar held in Japan in 1955 that she met her future husband, Maurice Copithorne (BA’54, LLB’55, LLD’02). She went on to complete graduate work in Anthropology and Southeast Asian Studies at Yale. They married in 1965 and they lived in Ottawa and as a rotational foreign service family, posted and lived in to various countries, such as Iran, Malaysia, the People’s Republic of China, Hong Kong, and Austria. After her husband’s retirement from the Foreign Service, they returned to Vancouver, where Tamako worked as Director of Japanese Culture and Communication at Simon Fraser University’s David Lam Centre for International Communication, retiring in 2000. All the while, her passion for cultural exchange remained undimmed. It was thanks to Tamako’s tireless efforts that this year’s BOMP-Keio University Choir-Early Music Vancouver collaboration possible. “With her long history of fostering Japanese-Canadian relations, Tamako was an essential part of making this project become a reality,” says Dr. Alexander Fisher, Acting Director of the School of Music. Together with her husband, Tamako also established the School of Music’s Kandler Scholarship. The Copithornes wanted to provide UBC School of Music students with similarly inspiring opportunities and established a scholarship to support study abroad. They named it in honour of friends Joseph and Melitta Kandler as a tribute to the Kandlers’ commitment to music and to fostering enduring cultural and economic ties between Canada and Austria where the Copithornes were once posted. Over the years many Keio students have visited UBC (and vice-versa), while the Kandler scholarship has enabled many UBC students to travel abroad for vital musical training. Even now, Tamako feels an urgency about their mission: “Maurice and I benefitted so much by travelling to other countries and experiencing different cultures. That bridging is so important and it cannot be ignored,” she says.